How Can a Freelancer be Productive During Slow Periods? When a slow period happens, you often don’t see it coming. Everything is going great, the money is flowing, and you’re swamped with projects. Then, without warning, your freelance project to-do-list is so empty that you can practically hear the crickets. Sound familiar? When a slow period happens to a freelancer they often don’t see it coming. When a slow period happens, you might be tempted to binge watch something on Netflix or hit the panic button, but that’s not necessarily the best approach. Slow periods are a valuable means of improving every aspect of your freelance business. Although you should continue to market your work when you’re busy, there’s not always a sufficient amount of time to put just the right amount of TLC into your business. Here are five things you can do to productively take advantage of the spare time that you’ll have during slow periods. The great thing about your past clients is the fact that they’ve worked with you before, so you don’t have to sell them on how great you are at your work. Let them know that you have some extra time free this month, and ask them if there’s anything else that they need help with. Don’t be shy about asking for referrals, because your client might also know someone that could use your help! 2. Pitch, Pitch, and Pitch Some More! Although this is something that will likely be part of your marketing strategy no matter what, slow periods are a great time to increase your daily pitch quota. Set some time aside, to write the best quality pitches that you can think of, and get your ideas in the hands of your ideal clients. When you’re busy, there’s too much to think about, including impending deadlines. Slow periods are the best possible time to put some careful thought into what your long-term goals are, as a freelance writer. Ask yourself these three questions, and write down the answers, if necessary. What’s your ideal income, and what can you do to continuously reach your financial goals? What do you want to improve on, and what can you do about it? Are you happy with your current clients? If not what kinds of clients would be perfect for you, and what do you need to do to attract your ideal client? Enrolling in a class is a great way to stay up to date on niche-applicable skills. Fortunately, you don’t have to spend a fortune to learn new skills. There are plenty of options out there that are either free or affordable. Taking a class is a great way to stay productive, gain some useful skills that will “wow” potential clients, and network with other community members. If it’s an in person, rather than an online class don’t forget your business cards, because your instructor, and also your peers, might be the perfect lead. Portfolio updates, website updates, social media profile updates are the kinds of things that can make or break potential leads. If you don’t need to update any info, focus on making your online presence a hundred times better. There’s always something to fix, even if your online profiles are in top-notch condition. When your work is keeping you busy, social media, portfolio, and website updates are often overlooked, and that’s okay. If you set some time aside during slow periods to make online profile updates and revisions, you’ll be grateful for all your hard work, when the client projects start to pile up. Always remember that slow periods aren’t something to be ashamed of! Even the most seasoned and successful writers and freelancers go through slow periods, especially during holidays, and specific times of year. How do you stay productive during slow periods? Do you have any coping strategies? Feel free to comment in the comment section below. How Do I Speed Up My Freelance Site? Rosemary Richings is a freelance web and blog content writer for hire that works with, and writes about local businesses. Specialties include ghostwriting, web/blog content copywriting, business profile writing, and more. Rosemary’s work has been featured on a wide variety of websites including the Kijiji Canada blog, Befunky, the Yellowpages website, and more. Feel free to follow her on Twitter, and check out her blog, Rosie Writing Space, an online journal of the writing life. You’ve provided some awesome tips to help remain productive in your freelance writing business. 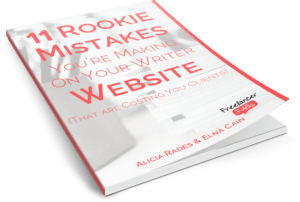 A lot of time for freelancers, when there’s no work, you pitch a little, maybe do a guest post but many don’t think about looking at sprucing up you web copy or reach out to past clients or even look at your long-term goals as ways to generate more work. Thanks Elna, glad you liked the tips! I think the most important lesson I’ve learned about freelancing, especially blogging, is that so much of it is about relationship building. I think my slow periods have been the best way to make sure those professional relationships with prospective and current clients are continuing to grow. I have a significant other that also freelances and that’s for sure one of the most important things they taught me about how it all works. A very good post. It’s true that most freelancers I included tend to panic when the low season sets in. Usually, you are worried about your income and how to survive before the high season is back. However, low seasons can be an opportunity to work on your customer relations as well as enhance your market reach through effective marketing efforts. More so, it’s good to evaluate and realign your business goals and objectives.